Entering arguably one of the strongest drafts in recent years, it’s going to be pretty hard for Toronto to strike out swinging with the fourth overall selection. Dylan Strome is expected to develop into an elite centre, Mitch Marner into a top line winger and Noah Hanifin should transition into a first pairing defenseman. Blue liner Ivan Provorov and centre Matthew Barzal, two other elite talents, should also be available when Toronto is on the clock. The Leafs are missing countless pieces to the puzzle but each player listed can assist the “scorched-earth rebuild.” Toronto hasn’t had a true first line centre since Mats Sundin joined Vancouver, though a Hanifin acquisition alongside Morgan Reilly could fortify Toronto’s back end for years to come. Strome and Hanifin aside, however, Marner should not be overlooked. 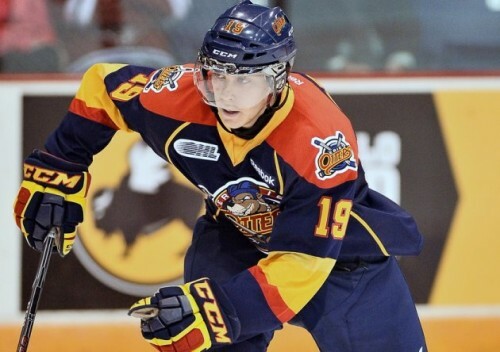 Said to be the most skilled player entering the draft beyond Connor McDavid, Marner brings an offensive flare and grit similar to former Leafs captain, Doug Gilmour. Entering the draft these are the qualities Toronto is looking for. “We’re looking at skill,” said Leafs director of player personnel Mark Hunter. “Skill to us is hockey sense. Puck skills… but you can never leave out character.” Skill aside, Marner is always the first guy on the puck and the first guy coming back. He finishes all of his checks despite his five-foot-eleven, 160-pound frame and could be the cornerstone player the Leafs need. Though while he’s skilled, fast and wears number 93, top centres and defencemen are more coveted than top-line wingers. Fortunately Marner did spend time up the middle this season and developing him at centre remains a possibility, but with William Nylander in the system, a top winger may be just what the doctor ordered for the blue and white. And while it’s almost certain the Leafs will select one of the three players discussed, Provorov and Barzal are definitely worth consideration. Back in 2012 before Jack Eichel entered the picture, the 2015 draft class was projected to be between McDavid and Barzal. Unfortunately after suffering a knee injury this season Barzal was sidelined for three months and missed the World Junior Championship, but still managed to register 57 points in 44 games. Had he remained healthy, it’s said Barzal would be ranked in the top five entering Friday’s draft. On the other hand, Provorov finished fourth in points amongst WHL defenseman, tallying 61 in 60 games and leading all rookies in scoring. Initially projected as a second to third round selection when Central Scouring released it’s preliminary 2015 rankings, Provorov has since shown that he could potentially crack the top five. Friday’s selection will be the highest pick Toronto has had in 26 years and the talent pool runs deep. There’s no doubt Friday’s selection will speed development, but Toronto will have to decide the rebuild’s direction.